Is The Dalai Lama Playing A Dangerous Game? The Dalai Lama shocked the world of Buddhism when he announced that he was giving up his political powers as head of the Tibetan government in exile. Some analysts say the aging leader is beginning a risky strategy to preserve the spiritual leadership of Tibetan Buddhism in the event of his death. Is The Dalai Lama Playing A Dangerous Game? 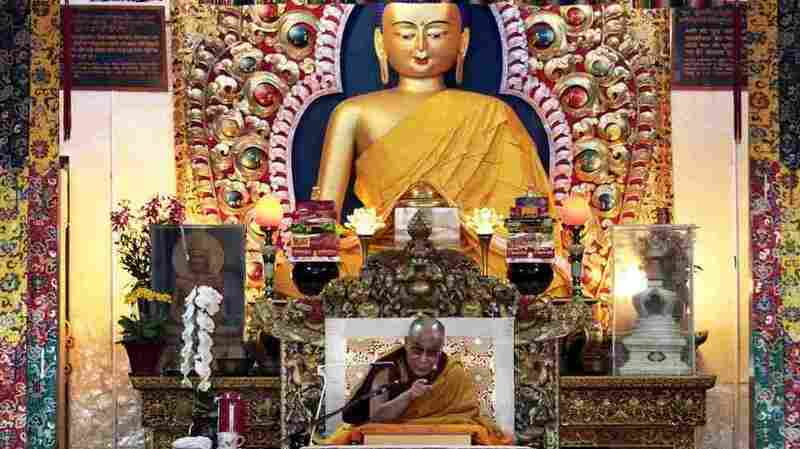 The Dalai Lama gives a religious talk at the Tsuglakhang temple in Dharmsala, India, on March 15. Just last month, the Dalai Lama sent a shockwave through the world of Buddhism when he announced that he was giving up his political powers as head of the Tibetan government in exile. For more than 50 years, the Nobel peace laureate has been the public face of resistance to Chinese control of Tibet. Some analysts say the aging leader is playing the opening moves of a risky strategy to preserve the spiritual leadership of Tibetan Buddhism in the event of his death. The Dalai Lama's headquarters is in Dharamshala, India, where Buddhist temples and monasteries cling to slopes that rise to the snow-capped mountains of the Himalayas. Tibetan exiles come to this temple to pray and walk counterclockwise around the sanctuary, turning the big brass cylinders that are believed to release prayers and mantras. The Indian government allowed the 14th Dalai Lama to establish himself here when he and many of his followers escaped from Tibet after a failed uprising against the Chinese in 1959. Many more Tibetan refugees live in settlements in South India, or are scattered across the globe, including in the United States. Now, the Tibetan refugee community is trying to come to terms with the news that Tenzin Gyatso, the Dalai Lama, will pass his political powers to elected leaders of the Tibetan government in exile. "From the point [of] view of his holiness, it is for the good of the Tibetans for the long haul," says Chhime Chhoekyapa, the Dalai Lama's secretary. "But from the Tibetan people's side, for many of them, it is something that is unthinkable." Chhoekyapa says it's a hard development for people to digest when they have known no other political leader for more than 50 years. Tenzin Gyatso is 75 years old and, though he keeps a busy schedule of travel around the world, he has suffered bouts of ill health. The choice of his successor is governed by the belief that when the Dalai Lama dies, he reincarnates himself in another body to continue his work. "Reincarnation is a belief," says Thubten Samphel, secretary of international relations for the government in exile. "You either believe in it, or you laugh at it. We Tibetans believe human beings have the spiritual resources to reincarnate, especially [highly] realized beings, at a time and place of his choosing." The tradition calls for senior Tibetan lamas to find the child who is determined to be the reincarnation of the leader who has died. That child is then brought up and educated to be the next Dalai Lama. China, which claims Tibet as part of its territory, has intervened in the choosing of two other major Tibetan lamas. The best-known case is that of the Panchen Lama. In 1995, the Chinese government rejected a boy chosen by the Dalai Lama and other Tibetan leaders. They supervised the selection of a Panchen Lama of their own, who has never been accepted by most Tibetans. The boy who was selected by the Dalai Lama is said to be alive, in Chinese government custody, but his whereabouts are unknown. Brahma Chellaney, an Indian expert on Tibetan issues, says that's a situation the Dalai Lama is trying to avert. "If the same situation were to happen after the present Dalai Lama were to pass away, then we will have two dueling Dalai Lama," says Chellaney, a professor at the Centre for Policy Research in New Delhi. Chellaney thinks Tenzin Gyatso is trying to make the institution of the Dalai Lama less of a target by separating the political powers from the spiritual leadership while he's still alive. "I think it's a smart move because once he passes away," Chellaney says, "there will be great opportunity for the Chinese to take advantage of the situation and impose their own impostor Dalai Lama on the world." Officials of the Tibetan government in exile say there is precedent for the Dalai Lama to choose a successor while he is still alive — a person who would later become his reincarnation. Editorial writers in the official Chinese media have already accused the Dalai Lama of trying to manipulate the reincarnation process to designate a successor during his lifetime. A committee of Tibetan scholars and officials is working to change the charter of the government in exile to specify exactly how the Dalai Lama's powers will be handed over. The process of change will begin once a new government has been installed. The government in exile is about to announce the results of an election for a new parliament and chief minister. In the meantime, life goes on for the exile community in Dharamshala known as Little Tibet. People come to pray and turn the mantra wheels as they have done for 50 years. Monks chant as they renew their vows. Everyone here knows that change is coming, but no one is sure what that change will bring.